A nasty storm with rain, wind and cold continues to drench the region, and it's expected to deliver a little snow before it moves on overnight. About 1-3 inches of rain had fallen around the area by Wednesday evening, approaching record rainful totals for Dec. 7 dating to 1871, Storm4 meteorologist Doug Kammerer said. At 2 p.m., the National Weather Service issued a flood warning for the greater Washington metropolitan area. Creeks and streams could run over their banks and obstruct roadways. Have pictures of storm damage or flooding? Email them to weather@nbcwashington.com. 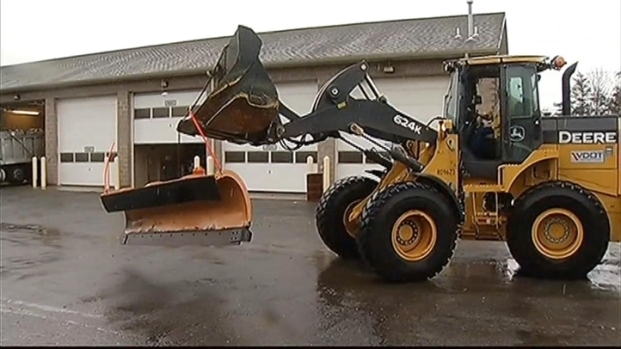 The rainy weather on Wednesday slowed efforts to treat roadways ahead of the possible snowfall. Route 1 at Ammedale Road in Beltsville, Md., was closed Wednesday evening because of high water, and one person was rescued from a vehicle stuck there. In Upper Marlboro, Water Street and the 5400 block of Marlboro Race Track Road were closed due to high water. Wednesday morning, there were multiple reports of flooding on northwest D.C. roads. In addition to flooding, the wind could team with the soaked ground to cause downed trees and power outages. Throughout the day, numerous weather related traffic accidents occurred throughout the region. A sinkhole opened up in northwest D.C. on Military Road at Beach Drive as a result of overnight rains. A winter weather advisory also has been issued for parts of the area, including Rappahannock County, Loudoun County, Howard County and Frederick County. Those expire early Thursday. On the tail end of this storm a strong area of low pressure is pulling in cold air. That could mean a dusting of snow along the I-95 corridor between 11 p.m. and 1 a.m. Between 8 p.m. and midnight, 1-3 inches is possible along I-81, with more possible at higher elevations. 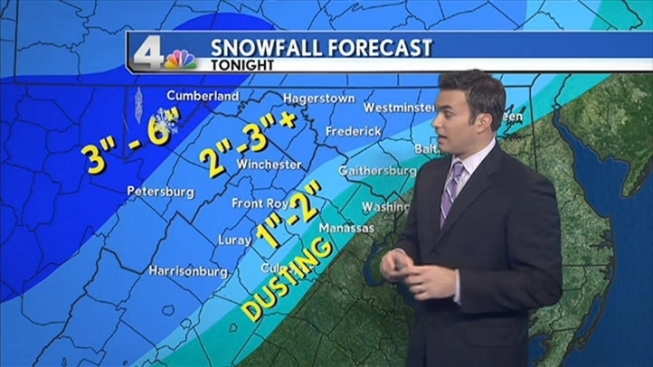 Further north and west, expect 3-6 inches, but don't expect any snow south or east of D.C. When that happens, the rain could change over to sleet, and possibly snow. Accumulations of 1 - 3 inches are possible in Loudoun, Frederick, and counties farther west in Virginia. Closer to D.C., if snow does fall, it will likely just be a dusting. The storm moves out overnight, and roads should be fine for the commute Thursday morning. It will be a colder commute, though. At 6:30 a.m. on Wednesday, the temperature in the District was a mild 60 degrees. It is expected to fall below 40 degrees, and high temperatures are not expected to climb out of the 40s over the next several days.